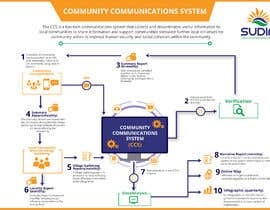 Our organization has developed a low-tech Communications System called the Community Communications System (CCS) that collects and disseminates useful information to local communities. 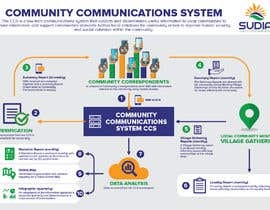 We are looking to design a Data Flow Diagram to visually represent the flow of data in the different components of the our Community Communications System (CCS). 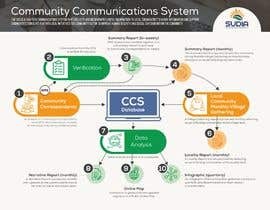 We are looking for a design that can easily represent how our CCS system works in a simple and visually attractive way. 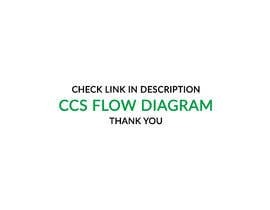 Below is a description of the various components of the CCS and the design requirements. 1. 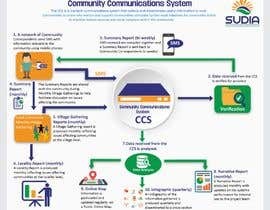 A network of Community Correspondents send multiple short-message summaries (SMS) with information relevant to the community using mobile phones to the CCS system weekly. 2. 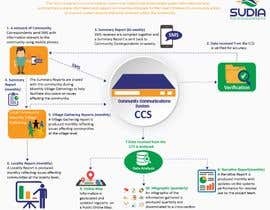 The CCS system verifies the SMS received for accuracy. 3. 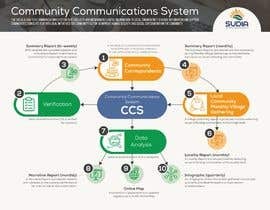 All verified SMS received are compiled by the CCS system and a Summary Report is sent bi-weekly back to the Community Correspondents. 4. 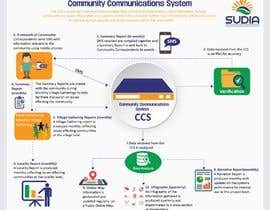 The Summary Reports are shared with the community monthly during Monthly Village Gatherings to help facilitate discussion on issues affecting the community. 5. 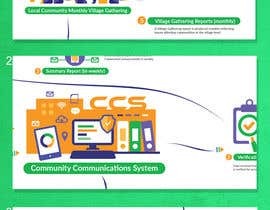 A Village Gathering Report is produced monthly from the Village Gatherings reflecting issues affecting the community at the village level and sent back the CCS System. 6. 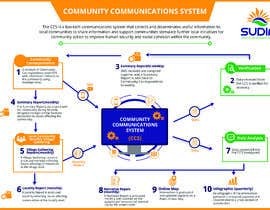 A Locality Report is produced monthly reflecting issues affecting communities at the locality level. 7. 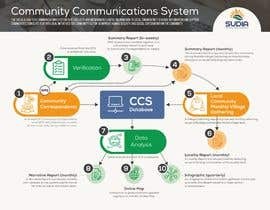 All data received from the CCS is analyzed. 8. A Narrative Report is produced monthly with updates on the systems performance for internal use by the project team. 9. 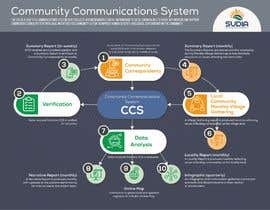 Information from the CCS is geolocated and regularly update a Public Online Map. 10. 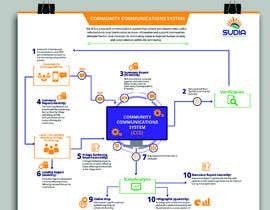 An infographic of the information gathered is produced quarterly and disseminated to a cross-section of stakeholders . 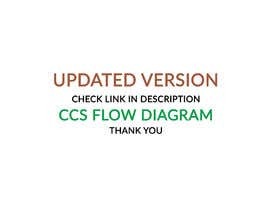 	The design should use the same labeling and text as seen in the attached CCS Data Flow Diagram. 	The visual symbols used to represent the flow of information should incorporate graphics (e.g. 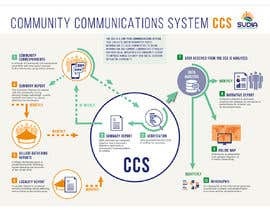 the Community Correspondent sends an SMS to the CCS System could include a graphic of a person and a mobile) Be Creative. 	File format: The design will be used for both print and online and should be high quality. Final product must be delivered in different file formats for printing and be created as a template which can easily be altered if need be. Only Three days left in the competition !!! •When designing the data flow diagram make sure the order of the flow of data is easy to understand for those who do not know how the system works. (especially between 1,2 and 3 are a bit confusing). •	The graphics/icons used in the diagram should be culturally neutral as we work with a diversity of different cultures. •	For the color schemes SUDIA logo colors should be incorporated . •	Select Fonts which are easy to read. Thanks! Looking forward to receiving your creative designs.